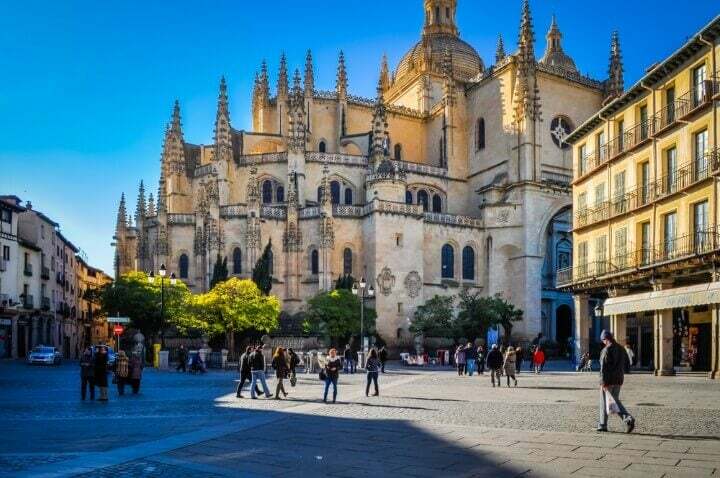 When you visit the city for the first time, Segovia greets you in an almost mythological fashion, as if you has stumbled into a city of giants. The spectacular Roman aqueduct foreshadows the epic and aesthetic proportions we are about to encounter. 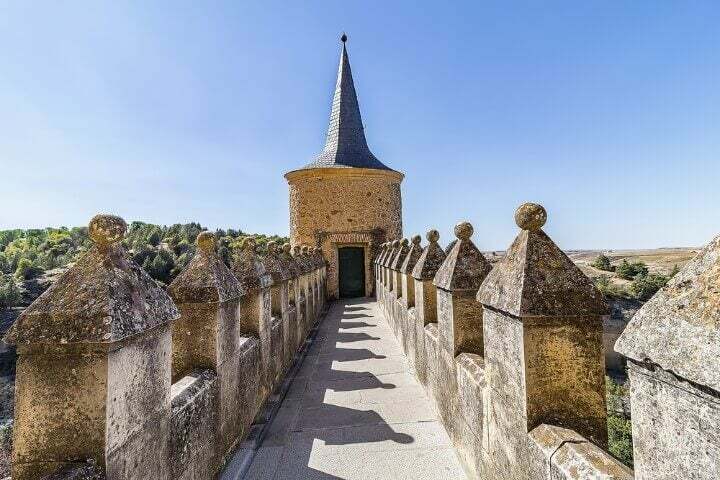 From the aqueduct, and after walking for a bit, when you think the proportions have returned to what’s expected of a small city, you’re suddenly faced with the fairy-tale castle, sitting herculean upon a hill, known as the alcázar (‘fortress’). 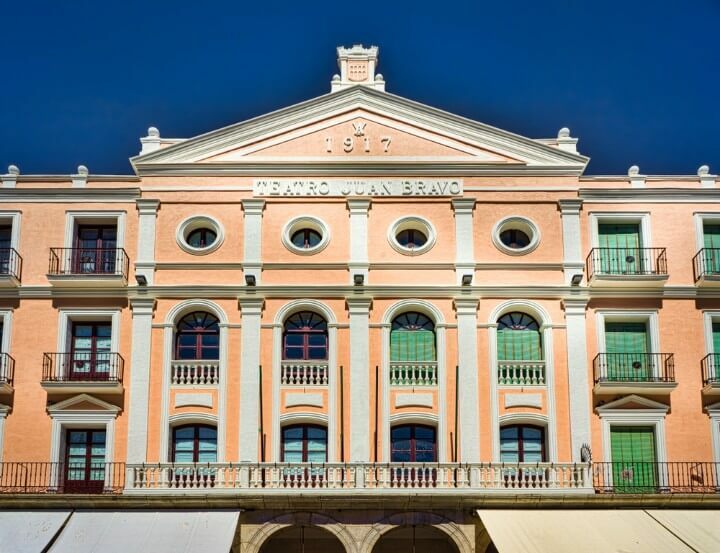 Are you ready to discover everything this Spanish city has to offer? Read on! 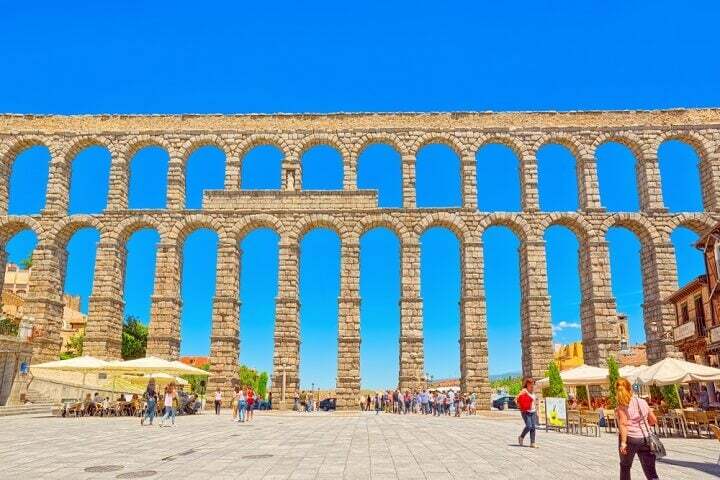 The adventure can’t begin at any other place than at the foot of the Roman aqueduct – the city’s most impressive landmark. 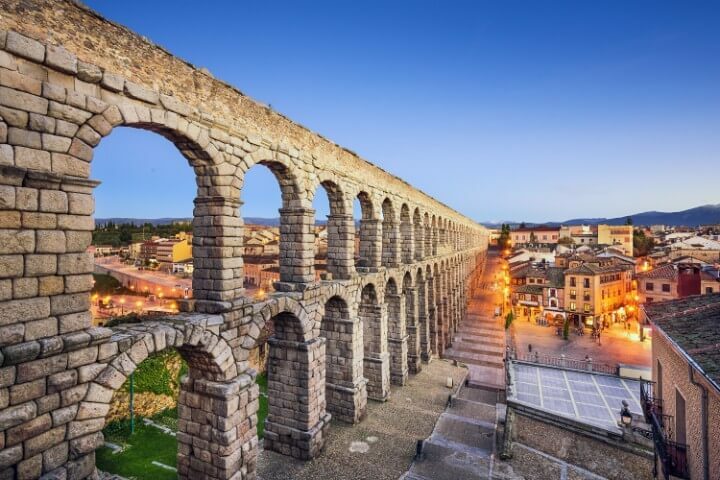 We stand before the single best-preserved example of Roman civil architecture in Spain. 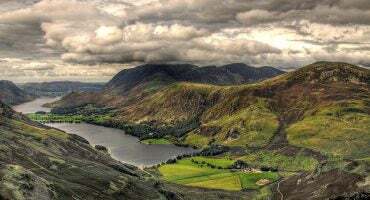 The history books sustain that support our fantasy insist that it was erected at the turn of the 2nd century AD and that it was used for conducting water from the mountain range along a channel that was reportedly dozens of kilometres long. 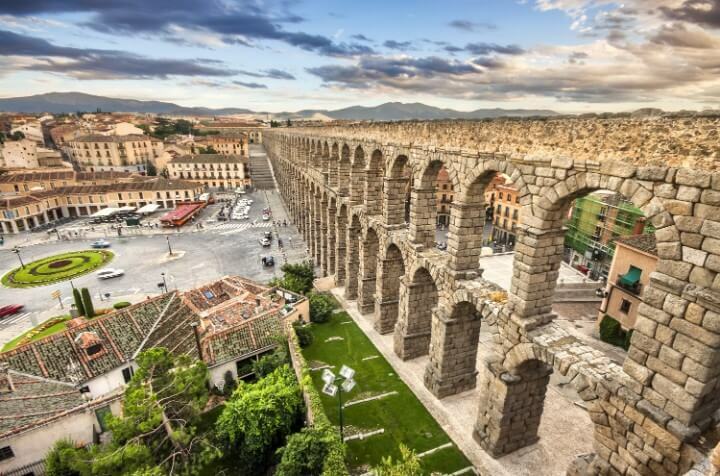 What we see today, i.e., the raised aqueduct, is almost 30 metres high and 728 metres long. Colossal. Nobody would bat an eye if they were told that cyclops had raised the 167 arches we can see today. The sloping asphalt allows one to contemplate it from a variety of vantage points. If you walk away from it, check out the panorama. The view is breath-taking. Some would have you believe it wasn’t built by giants, but by the devil himself who, after making a deal with a water carrier, erected the monument in a single night. In exchange, the little troublemaker got to bag the reckless water carrier’s soul. 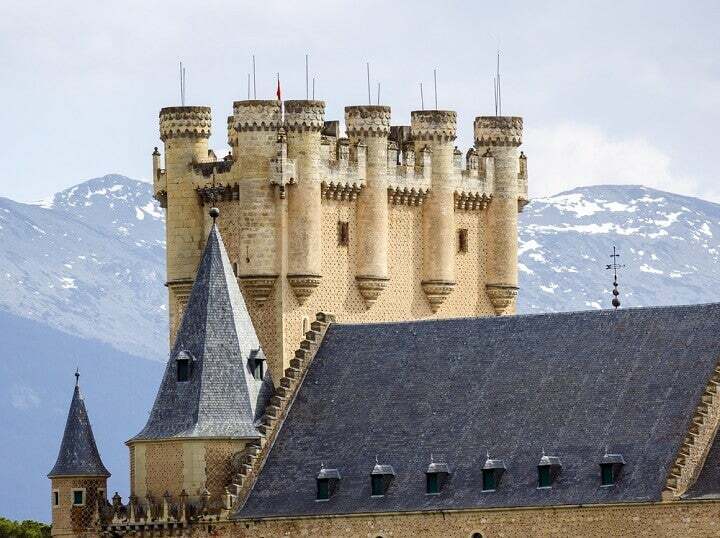 And what kind of fairy-tale would Segovia be if it didn’t have its own castle? As stipulated by fable canon, ours is a medieval castle. It’s mentioned in texts that date as far back as the 12th century, although it’s most famous for its protagonism towards the end of the Middle Ages, in the turbulent 15th century, the same century that would define the future of the Iberian Peninsula and that of most of Europe. 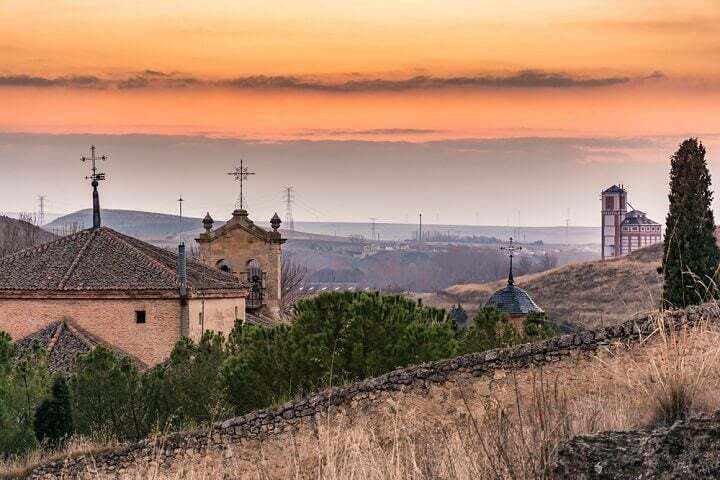 Today, like then, it stands imposingly upon a rock in the intersection of the valleys of the rivers Eresma and Clamores, offering a serene and slender silhouette that looks like a Disney still. It isn’t hard to imagine princes and princesses leaning out of its distinguished tower. As intimidating as it looks, any adventurer worth his salt should commit to exploring the castle in all its detail. So, we walk in through the spectacular entrance tower, erected in times of John II (15th century), and delve into its interior. We can step back in time in the 12th-century Hall of the Old Palace, briefly feel like powerful kings in the Throne Room, and contemplate the visages of the kings of Castile who took refuge here, whether from time to time or on a permanent basis (the last one being Joanna the Mad, who died in 1555) in the Hall of the Kings. If we have enough strength left, we can climb all 156 steps to the tower of John II and contemplate a magnificent view of the whole city. 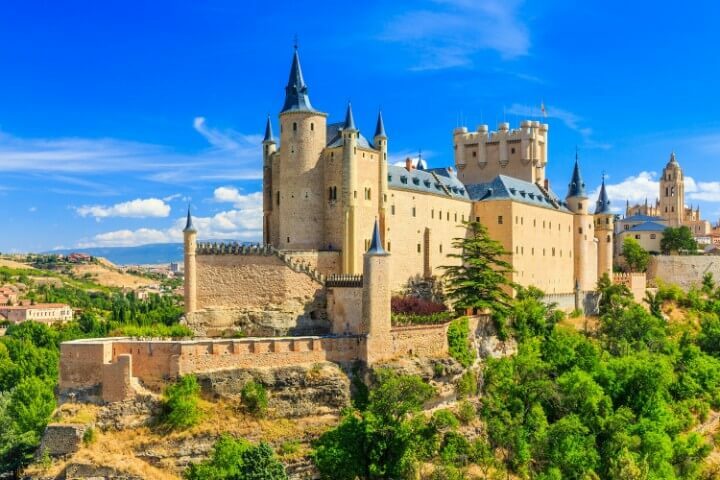 ✈️ Search flights to Spain! All good adventures must include open spaces of pure, relaxing greenery. 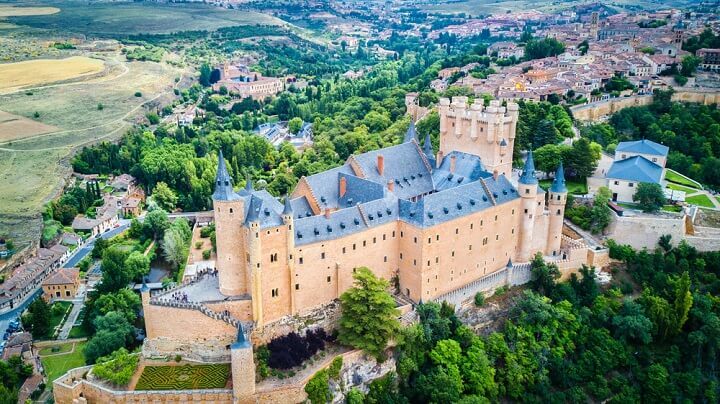 And if, as is the case in Segovia, on our way we can stumble across some outstanding monuments, laziness is not an excuse. 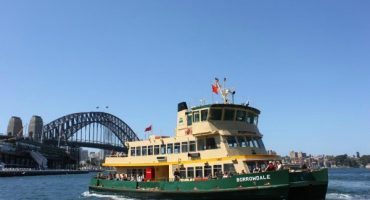 Nature and culture stroll with us hand-in-hand. 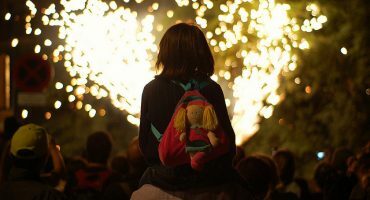 Thus, putting some distance between ourselves and the city centre, we head towards the banks of the river Eresma until reaching the park called Alameda del Parral. 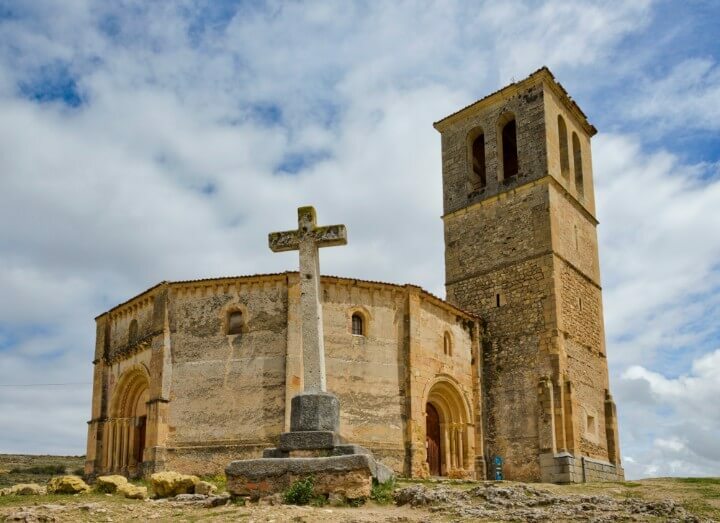 The colour green reigns supreme as we walk along a glowing path until the magnificent monastery of El Parral – late Gothic, but dating back to the turn of the 15th century – prompts us to make a stop. We continue along that path searching for yet another of the city’s hidden treasures: a very special temple, the 13th-century church of Vera Cruz, with a 12-sided circular layout that fascinates all who set eye on it. Even more so when we discover the legend that attributes its construction to the Templars, filling the church with all the mysteries usually associated with this order. Though, truth be told, apparently Templars had very little to do with the building’s construction; it was, in fact, the order of the Holy Sepulchre that erected it in the mid-13th century. In the 14th century it was taken under the wing of the order of Malta. 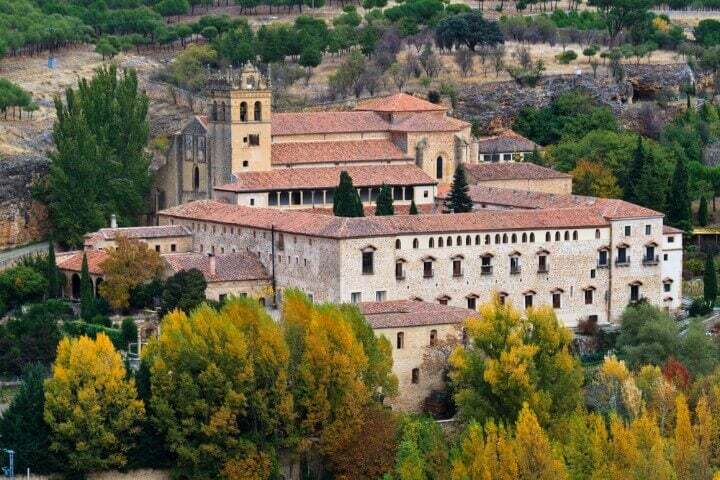 A few hundred yards away is the convent of the Barefoot Carmelites, whose claim to fame is that it contains the tomb of one of the most important Spanish poets of all time: saint John of the Cross. A few feet further we encounter the sanctuary of the Virgin of Fuencisla, patron saint of the city. The moment we step out of any of these temples is a good time to pause and look around. 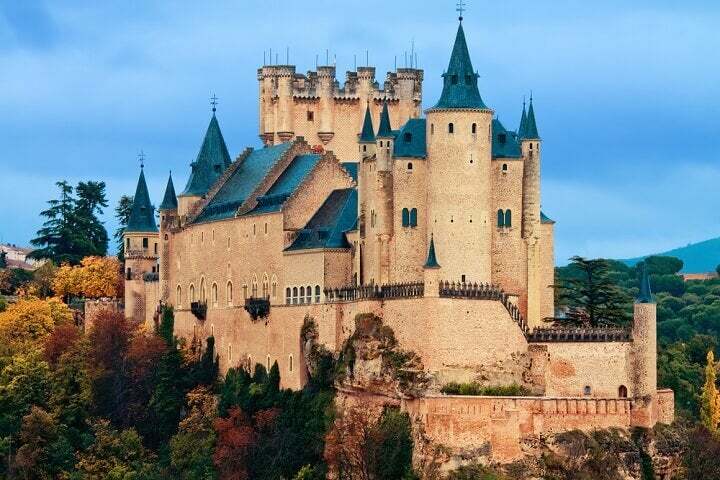 We are always greeted with spectacular views of the alcázar. Segovia, once again, stands haughtily with its cartoon castle protecting us from on high. Bewitched, we return to the city centre. 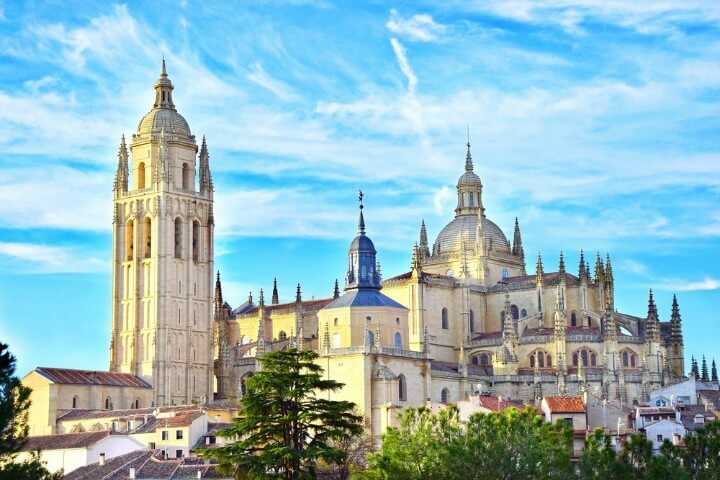 For a small city, Segovia is full of life and places in which to spend our 48 hours. 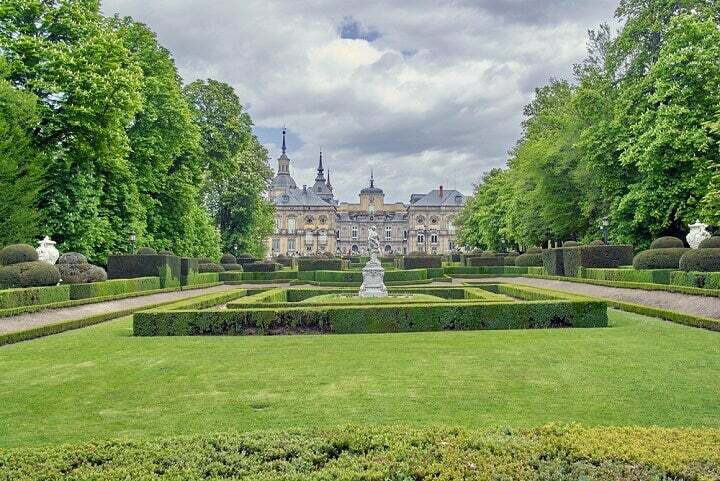 Despite that, it’s worth putting aside some time to visit a real king’s orchard, the Royal Place of La Granja de San Ildefonso. Located 7 miles from the city, a mere 20 minutes away, a bus will drive you to a place whose luxuriance is comparable to that of Versailles. 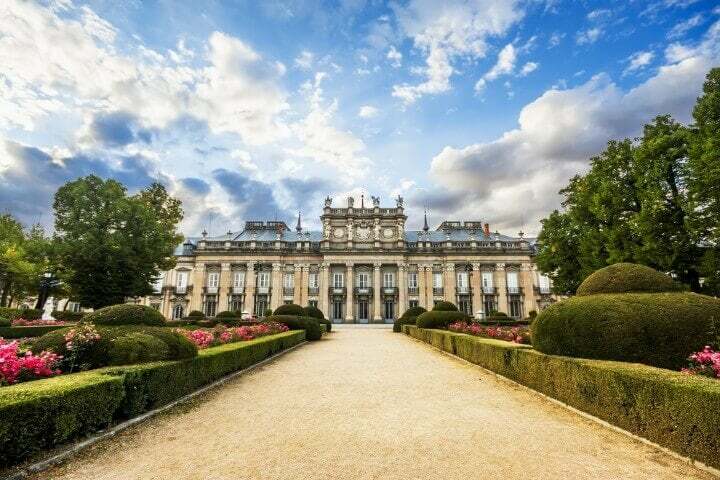 The reference is more appropriate than you may think: the palace that looms over the grounds was erected by order of the first of the monarchs of the French House of Bourbon to rule in Spain: Philip V, whose reign extended from 1700 to 1746. 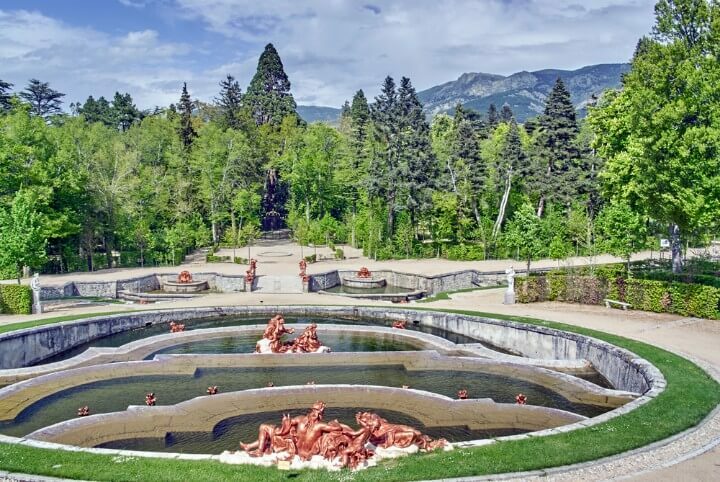 26 fountains – if you’re lucky enough to visit it on a day when they’re operative, you’ll be deeply moved. 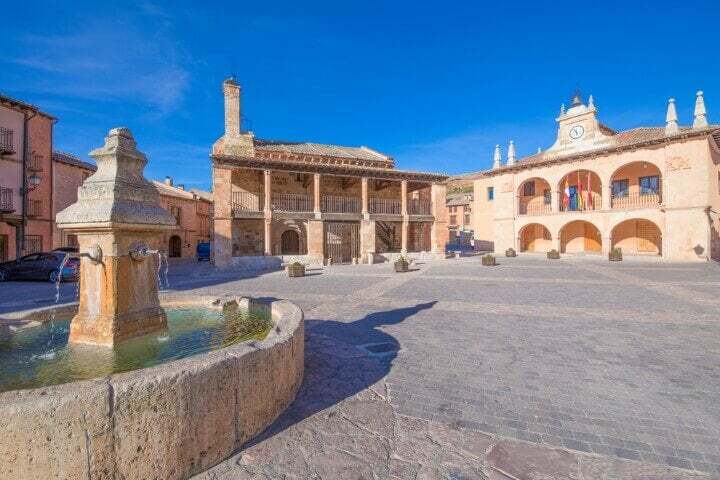 Before returning to Segovia, don’t forget to walk through the old city of the secluded, romantic town of San Ildefonso. Our journey would be incomplete if we didn’t drag our tired feet to the city’s Main Square. The Segovia experience will be all the more worth it if we then sit on a terrace to enjoy a drink and a snack. And, while we’re at it, admire the pinnacles of the apse of the grand 16th-century cathedral known as ‘the Lady of cathedrals‘ because of its size and elegance. From the square we can also see the City Hall and the Juan Bravo Theatre. From the comfort of our terrace chair, we then set off to explore the winding streets that crisscross around the centre. At some point we’ll stumble into some of the finest examples of Spanish Romanesque architecture: the Church of Saint Miguel, which can be easily identified by its atrium’s columns; that of Saint Esteban, boasting a tower that’s one of the most perfect representations of this Mediaeval style; or the sober Church of the Holy Trinity. Some of these temples are to be found hidden in the intricate layout of the ancient Jewish quarter, where a powerful Hebrew community once lived during the Middle Ages, and where we can still see a well-preserved synagogue, today transformed into the Church of Corpus Christi. 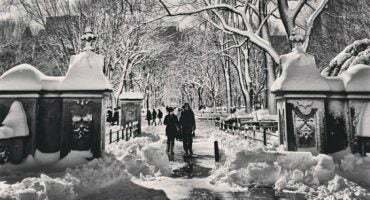 New York Covered in Snow!